Mar 07: Allen Institute for Brain Science in Seattle, WA. Mar 05: LAK19: 9th International Learning Analytics and Knowledge Conference in Tempe, AZ. Feb 21: Department of Intelligent Systems Engineering (ISE) at Indiana University School of Informatics, Computing, and Engineering (E500 Course) in Bloomington, IN. Mar 04: LAK19: 9th International Learning Analytics and Knowledge Conference in Tempe, AZ. Feb 05: IBS Workshop Media Computing in Lauta, Germany. Dec 14: Rebuilding a Kidney Scientific Meeting in Washington, DC. Oct 27: OurCS Hello Research 2018 Conference: Augmented Reality Visualizations of IoT Data in Bloomington, IN. Sep 27: Data Science Meets Social Science, Social Science Research Commons (SSRC) in Bloomington, IN. Sep 26: Indy Big Data 2018 Visualization Challenge in Indianapolis, IN. Sep 08: Indiana University Jacobs School of Music in Bloomington, IN. Nov 14: Scientific Visualization Workshop Series: Fall 2018 in Bloomington, IN. Nov 13 - Dec 16: Museum Computer Network conference in Denver, CO.
Dec 06: Learning Analytics Fellows Poster Showcase in Bloomington, Indiana. Nov 27: Dagstuhl Seminar on “Network Visualization in the Humanities” in Dagstuhl, Germany. Nov 09: IU Online Conference in Indianapolis, IN. Oct 26 - Oct 28: OurCS Event at Indiana University in Bloomington, IN. Oct 10: Scientific Visualization Workshop Series in Bloomington, IN. Sep 29 - Oct 02: ASTC Annual Conference in Hartford, CT.
Sep 25: CRANE Distinguished Lecture Series in Crane, IN, USA. Sep 12: NSWC Crane Meeting in Bloomington, IN. Sep 10: Guest Lecture in E500 in Bloomington, IN. Sep 08: Round-Table Conversation on Innovative Thinking in Bloomington, IN. Aug 24: Precision Health Initiative SICE Meeting in Bloomington, IN. Aug 13: ISE@SICE, IUB Graduate Student Orientation in Bloomington, IN. Jun 26 - Jul 26: Flowbile Workshop in Leipzig, Germany. Jul 17: The European Summer University in Digital Humanities Leipzig, Germany in Leipzig, Germany. Jul 05: Doktorandenkolloquium"Education & Technology" in Dresden, Germany. Jul 02: Research Colloquium in Mittweida, Germany. Jun 12 - Jun 14: Innovation Growth Lab Global Conference in Boston, MA. Jun 04 - Jun 05: Complexity of Educational Ecosystems in Santa Fe, MN. Apr 25: Computer Vision Poster Session in Bloomington, IN. Apr 17: CRANE Distinguished Lecture Series in Crane, IN. Apr 12 - Apr 13: LuddyFest Research Horizons in Bloomington, IN. Apr 11 - Apr 13: Learning Analytics Summit in Bloomington, IN. Apr 12: SSRC in Bloomington, IN. Apr 07: 10th annual Midwest Undergraduate Cognitive Science Conference in Bloomington, IN. Apr 03 - Apr 04: SFI Colloquium on “From Judgement to Impact” in Santa Fe, New Mexico. Mar 28: HUBzero Community Meeting in Bloomington, IN. Mar 23 - Mar 24: CEWIT Summit 2018 in Bloomington, IN. Mar 13 - Mar 14: NAS Sackler Colloquium on “Creativity and Collaboration: Revisiting Cybernetic Serendipity” in Washington, DC. Feb 27: CREST Advisory Board Review in Bloomington, IN. Feb 26: Addictions Grand Challenge. Feb 23: Intro to Python Web Scraping Faculty Workshop in Bloomington, IN. Feb 20 - Feb 21: Informing Environmental Health Decisions Through Data Integration in Washington, DC. Jan 25: the Exploratorium in San Francisco, CA. Mar 24 - Jan 24: Illinois Indiana ASEE Section Conference. Jan 16: NSF NSCI Lecture Series in Alexandria, VA.
Oct 31 - Dec 31: ERC Biennial Conference in Alexandria, VA.
Dec 04 - Dec 05: Modeling and Visualizing Science and Technology Developments Sackler Colloquium in Irvine, CA. Nov 29 - Nov 30: Future Technologies Conference in Vancouver, Canada. Nov 16: Science Center World Summit in Tokyo, Japan. Oct 04 - Nov 15: Free 'R' Crash Course: Oct. 4, 11, 35 and Nov. 15 in Bloomington, IN. Nov 07: Overleaf Crash Course, 9am-2pm in Bloomington, IN. Nov 06: ONR Distinguished Lecture Series in Arlington, VA.
Nov 02: ISE Undergraduate Student Orientation in Bloomington, IN. Nov 01: Open Science Forum in Bloomington, IN. Oct 31 - Nov 01: ERC Biennial Conference in Arlington, VA.
Oct 16 - Oct 20: ISSI 2017 in Wuhan, China. Oct 20: Data Science Post-Secondary Education Roundtable in Chicago, IL. Oct 16 - Oct 20: 16th International Conference on Scientometrics and Informetrics in Wuhan, China. Oct 19: Megaputer Analytics Conference in Bloomington, IN. Oct 17: Reproducible Scientometrics Research: Open Data, Code, and Education in Wuhan, China. Oct 17: Workshop on “Reproducible Scientometrics Research” in Wuhan, China. Oct 15: E599 Lecture in Bloomington, IN. Sep 19 - Sep 21: OECD BLUE SKY III in Ghent, Belgium. Sep 18: Fashion Tech Week NY, The Internet of Fashion in New York, NY. Sep 15: Advancing Teaching and Learning with Technology Symposium in Indianapolis, IN. Sep 14: Indy Big Data Visualization Challenge in Indianapolis, IN. Sep 06: Opening Reception at Virginia Tech’s Newman Library in Blacksburg, VA.
Aug 25: European Forum Alpbach 2017 in Alpbach, Austria. Aug 17: ISE Student Orientation in Bloomington, IN. Aug 17: Meeting with Carol Rogers, Deputy Director and CIO of the Indiana Business Research Center, Mark Lawrance, Senior Vice President, Foundation and Operations, Darshan Shah, Chief Data Officer in Bloomington, IN. Jul 15 - Jul 20: Alzheimer's Association International Conference 2017 in London, England. Jul 12 - Jul 14: Association of Midwest Museums in Des Moines, IA. Jul 09 - Jul 13: Practice & Experience in Advanced Research Computing 2017 in New Orleans, LA. Jul 10: Talk at University of Applied Sciences Mittweida in Mittweida, Germany. Jun 21 - Jun 23: NetSci 2017 in Indianapolis, IN. Jun 20: NetSci Conference in Indianapolis, IN. Jun 01: Virtual Presentation to NSF EEC Staff in Bloomington, IN. Apr 30: Salon Talk in Bloomington, IN. Apr 26: Monthly PHI Informatics Leadership Group Meeting in Indianapolis, IN. Apr 26: Open Science Forum in Bloomington, IN. Apr 21: Web Visualization Demonstration to Advanced Visualization Lab in Bloomington, IN. Apr 12: Data Science Invited Talk Series in Bloomington, IN. Apr 12: Open Science Forum in Bloomington, IN. Apr 07: The Media School Graduate Student Conference in Bloomington, IN. Apr 06: Third Annual IUB Innovation Conference & Reception in Bloomington, IN. Mar 22 - Mar 25: iConference 2017 in Wuhan, China. Mar 13 - Mar 17: 7th International Learning Analytics and Knowledge (LAK) Conference in Vancouver, BC, Canada. Mar 06: Closing Reception at the University of Iowa in Cedar Rapids, IA. Mar 02 - Mar 05: BrainHack Global Bloomington 2017 in Bloomington, IN. Feb 22: Lifelong Learning in Bloomington, IN. Jan 27: Opening Reception at Vanderbilt University in Nashville, TN. Dec 12: 2016 NSF Nanoscale Science and Engineering Grantees Conference in Arlington, VA.
Dec 12: Visualizing Nanoscience and Technology in Arlington, VA.
Feb 05: MSCH-T 604 Topical Seminar in Media & Society: Media Life in Bloomington, IN. Nov 15: Living Architecture Systems Launch in Toronto, . Dec 14: NSW NCSES: Can Network Measures Serve as Indicators of Knowledge Creation and Flow? in Washington D.C., . Nov 18: Modeling Science Technology and Innovation webinar in Bloomington, IN. Nov 18: Living Architecture Systems Group (LASG) Launch Event in Toronto, Canada. Nov 15: Indiana University Network Science Institute, Open Science Forum in Bloomington, IN. Nov 11: 2016 IU Online Conference in Indianapolis, IN. Oct 31: University of Texas Arlington in Arlington, . Oct 31: Bibliometrics and Research Assessment in Washington, DC. Oct 31: University of Michigan in Ann Arbor, MI. Oct 27: Data and Modeling Workshop on Graduate Education Investments and STEM Career Experiences and Outcomes in Arlington, VA.
Oct 19: Indiana University Network Science Institute, Open Science Forum in Bloomington, IN. Oct 17: Educational Data Science in Bloomington, IN. Oct 06: Economics of Science and Engineering Workshop The National Bureau of Economic Research (NBER) in Boston, MA. Sep 24 - Sep 27: Association of Science-Technology Centers Annual Conference 2016 in Tampa, Florida. Sep 19 - Sep 21: OECD Blue Sky Forum on Science and Innovation Indicators in Ghent, Belgium. Sep 08 - Sep 09: Research Horizons in Bloomington, IN. Sep 08: National Bureau of Economic Research in Cambridge, MA. Aug 03 - Aug 04: BPViz'16: Broadening Participation in Visualization Workshop in West Lafayette, IN. Jul 10 - Jul 13: Hypertext 2016 in Halifax, Canada. Jul 05: Analysis of Network Clustering Algorithms and Cluster Quality Metrics at Scale. Jun 21: i2b2 AUG/SHRINE Annual Conference in Boston, MA. Jun 16: Saving the Web: The Ethics and Challenges of Preserving What’s on the Internet in Washington, DC. Jun 15: Library of Congress in Washington, DC. Jun 14 - Jun 15: Centers for Disease Control in Atlanta, GA.
Jun 15: Identifying Key Areas in a Human BioMolecular Atlas in Washington, DC. Jun 14 - Jun 15: Center for Disease Control in Atlanta, GA.
Jun 14: An Introduction to Open Risk Assessment: Data Analysis and Information Visualization in Atlanta, GA.
May 17 - May 18: Modelling Science, Technology, and Innovation in Washington, DC. Apr 11 - Apr 15: Workshop II: Culture Analytics and User Experience Design Part of the Long Program on “Culture Analytics” in Los Angeles, CA. Mar 29: Center for Computational Research at SUNY Buffalo in Buffalo, NY. Mar 25: Indiana University Network Science Institute in Bloomington, IN. Mar 22 - Mar 23: International Symposium on Science of Science in Washington, DC. Mar 10: Deutsche Physikalische Gesellschaft (DPG) Symposium on “Scientometric Maps and Dynamic Models of Science and Scientific Collaboration Networks” in Regensburg, Germany. Feb 26: CEWiT, Indiana University in Bloomington, IN. Feb 11 - Feb 15: New Science Roadmaps for Global Research Panel, AAAS 2016 in Washington, DC. Feb 11: NHLBI Division of Cardiovascular Sciences in Bethesda, MD. Feb 08 - Feb 10: Cartographic Summit: Future of Mapping in Redlands, CA. Feb 05: Centers for Disease Control and Prevention in Atlanta, GA.
Feb 04: Inaugural Lecture in Atlanta, GA.
Feb 04: Emory University in Atlanta, GA.
Jan 14: Commerce Data Advisory Council (CDAC) January 2016 Meeting in Bloomington, IN. Jan 11: IUNI Web of Science Meeting in Bloomington, IN. Apr 02: University of Maryland in College Park, MD. Apr 02: National Center for Advancing Translational Sciences in Washington, DC. Dec 21: International Symposium on User-­Centered Social Media in Essen, Germany. Dec 09: Engineering Research Center Observatory Kick-Off Meeting in Washington, DC. Nov 30: CNS Open House 2015 in Bloomington, IN. Nov 15 - Nov 20: Supercomputing 2015 in Austin, TX. Nov 02 - Nov 03: Visual Analytics in Healthcare Workshop in Bloomington, IN. Oct 29 - Oct 30: Commerce Data Advisory Council (CDAC) Meeting in Boulder, CO.
Oct 17 - Oct 20: Association of Science – Technology Centers Annual Conference in Montreal, Quebec, Canada. Oct 14 - Oct 16: European Food Safety Authority (EFSA) Scientific Conference: Shaping the Future of Food Safety, Together in Milan, Italy. Sep 01: Center for Complex Systems & Enterprises Distinguished Lecture Series in Hoboken, NJ. Aug 31: CyberBridges Workshop in Arlington, VA.
Jul 14 - Jul 18: Visitor Studies Association Annual Meeting in Indianapolis, IN. Jul 16: Innovation in an Aging Society Progress Meeting in Cambridge, MA. Jun 29 - Jul 04: 15th ISSI Conference 2015 in Istanbul, Turkey. May 29: Symposium Honoring John T. Bruer in St. Louis, MO. May 15 - May 17: Computational Social Science Summit in Evanston, IL. May 14: Northwestern University in Chicago, IL. May 11 - May 12: Annual EA Conference 2015 in Bonn, Germany. Apr 29: Regenstrief Institute in Indianapolis, IN. Apr 22: Mundaneum Online Art Talk in Mons, Belgium. Feb 23 - Feb 27: The Fields Institute in Toronto, Canada. Feb 12 - Feb 16: AAAS 2015 Annual Meeting: Innovations, Information, and Imaging in San Jose, CA. Jan 21: Duke University in Durham, NC. Nov 05: Woman in Computing in Bloomington, IN. Oct 26: Yale University in New Haven, CT.
Dec 05: Science & Creativity Annual Conference (KOFAC) in Seoul, Korea. Dec 08: Network Science Talks in Bloomington, IN. Nov 16: Supercomputing Conference in New Orleans, LA. Nov 11: Rice University in Houston, TX. Nov 02: CNS Plug-and-Play Macroscopes Workshop in Bloomington, IN. Oct 07: Department of Computer Science, University of Arizona in Tucson, AZ. Oct 03: NSF Workshop on "Methodological Issues in the Evaluation of NSF's Interdisciplinary Research Programs" in Arlington, VA.
Sep 05: Computer Science Colloquium in Bloomington, IN. Sep 04: 10th Iteration University of Miami Opening in Miami, FL. Aug 06 - Aug 08: Fifth Annual VIVO Conference in Austin, TX. Aug 06 - Aug 08: 5th Annual International Science of Team Science (SciTS) Conference in Austin, TX. Jul 21: Platform for Enhancing Global Academic Strategic Collaboration in Science (PEGASCIS) Scoping Meeting in Washington, DC. Jul 08 - Jul 18: Summer School in Cognitive Sciences on Web Science and The Mind in Montreal, QC, Canada. Jun 25: OECD in Paris, France. Jun 23: European Commission Directorate-General for Research and Innovation in Brussels, Belgium. Jun 18 - Jun 19: Workshop at US Army Research Laboratory in Adelphi, MD. Jun 16: SWAM Meeting at NIH in Bethesda, MD. Jun 12: Institut des Systèmes Complexes Paris Île-de-France in Paris, France. May 02: Frontiers of Visualization Meeting Networking and Information Technology R&D (NITRD) Program in Bloomington, IN. Apr 07 - Apr 11: Workshop on Simulating the Social Processes of Science in Leiden, The Netherlands. Mar 25: OECD-Experts Dialogue on Scientometrics in Paris, France. Mar 17 - Mar 19: Science Centre World Summit in Mechelen, Belgium. Feb 13 - Feb 17: AAAS 2014 Annual Meeting in Chicago, IL. Dec 05 - Dec 07: Teaching Data: A CS10K Community-Wide Online Event in Bloomington, IN. Dec 03: Blooomington Science Café in Bloomington, IN. Oct 22 - Oct 25: SciELO 15 Years Conference in São Paulo, Brazil. Oct 15 - Oct 18: EDUCAUSE 2013 Annual Conference in Anaheim, CA. Oct 12: DID Conference in Montreal, Quebec, Canada. Sep 23 - Sep 24: Sci2 Tutorial at TD Ameritrade in Omaha, NE. 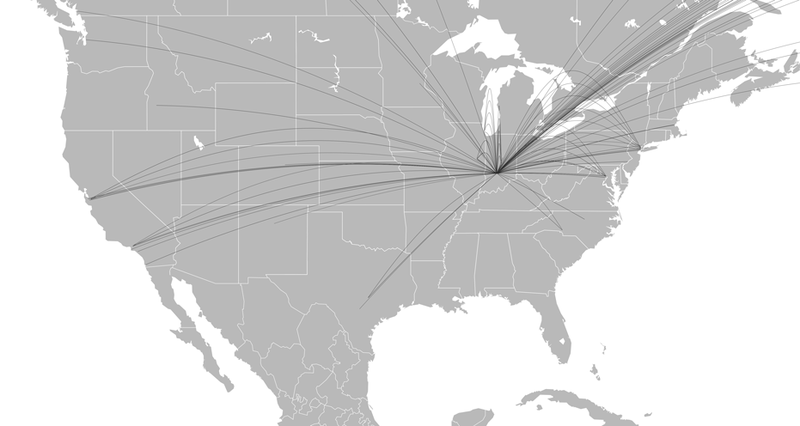 Sep 17: Data Visualization Guest Lecture in Bloomington, IN. Sep 10: American Chemical Society Meeting in Indianapolis, IN. Sep 07: Digital HPS Meeting in Bloomington, IN. Aug 14 - Aug 16: Fourth Annual VIVO Conference in St. Louis, MO. Jul 15 - Jul 19: 14th ISSI Conference in Vienna, Austria. Jun 27 - Jun 29: 6th Annual Political Networks Workshops & Conference in Bloomington, IN. Jun 24 - Jun 27: Fourth Annual International Science of Team Science Conference in Evanston, IL. May 12 - May 17: Dagstuhl Seminar on Information Visualization–Towards Multivariate Network Visualization in Dagstuhl, Germany. May 03 - May 04: 41st Annual LOEX Conference 2013 in Nashville, TN. Jan 28 - Apr 29: Networks and Complex Systems Talk Series, Spring 2013 in Bloomington, IN. Apr 25: D.C. Art Science Evening Rendezvous (DASER) in Washington, DC. Apr 10 - Apr 13: ACRL 2013 Conference, "Imagine, Innovate, Inspire" in Indianapolis, IN. Apr 11: Shared Horizons; Data, Biomedicine, and the Digital Humanities in College Park, MD. Mar 25 - Mar 26: Exploiting Big Data Semantics for Translational Medicine in Bloomington, IN. Mar 22: TEDx Bloomington in Bloomington, IN. Jan 23 - Jan 27: World Economic Forum Annual Meeting 2013 in Davos-Klosters, Switzerland. Jan 18: VIVO Workshop in Amsterdam, The Netherlands. Dec 13: International Symposium on Science of Science and Innovation Policy in Tokyo, Japan. Sep 10 - Dec 10: Networks and Complex Systems Talk Series, Fall 2012 in Bloomington, IN. Oct 26: BIG DATA SCIENCE: A Symposium in Honor of Martin Schultz at Yale University in New Haven, CT.
Oct 17 - Oct 19: NACIS 2012 Conference in Portland, OR. Sep 24 - Sep 25: Statewide IT Conference 2012 in Bloomington, IN. Sep 18 - Sep 21: GIScience 2012 in Columbus, OH. Sep 20 - Sep 21: Science of Science and Innovation Policy Principal Investigators' Workshop in Washington, DC. Sep 19: Indiana Economic Development Corporation Meeting in Indianapolis, IN. Sep 10: Faculty Data Working Group, IUB in Bloomington, IN. Aug 22 - Aug 24: Third Annual VIVO Conference in Miami, FL. Jul 23 - Jul 24: Portfolio Analysis Symposium in Bethesda, MD. Jul 21: 4th Biennial ISPST Conference in Pittsburgh, PA.
Jul 01 - Jul 07: European Summer School for Scientometrics (ESSS) in Leuven, Belgium. Jun 28: Institut für Forschungsinformation und Qualitätssicherung in Berlin, Germany. Jun 18 - Jun 22: NetSci2012 in Evanston, IL. Jun 06: KNAW, Het Trippenhuis in Amsterdam, The Netherlands. May 08 - May 09: A Festschrift for Richard M. Shiffrin in Bloomington, IN. May 01: Learning Analytics and Knowledge in Vancouver, British Columbia, Canada. Apr 26: College of Information Sciences and Technology in University Park, PA.
Apr 13: Organisation for Economic Co-operation and Development (OECD) in Paris, France. Apr 12: SWAM Meeting at NIH in Bethesda, MD. Apr 11: Médialab Sciences in Paris, France. Mar 23: Centre for Science and Technology Studies in Leiden, The Netherlands. Mar 08: 3rd International Meeting on Visualizing Biological Data (VIZBI 2012) in Heidelberg, Germany. Feb 16: Tutorial for Digital Arts and Humanities Scholars in Amsterdam, The Netherlands. Feb 03: College of Computer and Information Science in Boston, MA. Feb 02: Boston-Cambridge Colloquium series on Complexity and Social Networks in Boston, MA. Jan 26: NIH SWAM Teleconference in Bethesda, MD. Jan 23: Werklunch at DANS, KNAW in Amsterdam, The Netherlands. Nov 16: GIS Day at Indiana University in Bloomington, IN. Nov 15: American Society for Information Science & Technology (ASIS&T) Webinar in Bloomington, IN. Nov 14: S604/S764 Information Networks in Bloomington, IN. Nov 10: iSchool Faculty Lecture University of Pittsburgh in Pittsburgh, PA.
Oct 17: Sci2: A Tool for Science of Science Research and Practice in Arlington, VA.
Oct 10: 2011 Indiana CTSI at IU-Bloomington Retreat in Bloomington, IN. Oct 05 - Oct 06: Scientific Workforce Analysis and Modeling in Washington, DC. Oct 04 - Oct 05: Taming Complexity in Washington, DC. Sep 29 - Oct 01: University of North Texas Places and Spaces Exhibit Opening in Denton, TX. Sep 23 - Sep 25: Compatible Data Initiative Meeting in New York, NY. Sep 15 - Sep 16: From OpenSHAPA to Open Data Sharing in Arlington, VA.
Sep 14: EERE and ARPA-E Workshop on Measuring and Communicating Program Impacts in Washington, DC. Aug 24 - Aug 26: Second Annual VIVO Conference in Washington, DC. Aug 23: Science/AAAS in Washington, DC. Aug 22: National Academy of Sciences in Washington, DC. Jul 21: Fidelity Investments in Boston, MA. Jul 10 - Jul 14: Scientific Discovery through Advanced Computing Program (SciDAC) in Denver, CO.
Jul 11: Bodleian Digital Library Systems and Services in Oxford, UK. Jul 04 - Jul 07: I3th ISSI Conference 2011 in Durban, South Africa. Jun 30 - Jul 01: Representing The Republic of Letters in Den Haag, The Netherlands. Jun 30: FuturICT Meeting on the Innovation Accelerator in Zürich, Switzerland. Jun 23: Brownbag Talk, Sara Irina Fabrikant Team in Zürich, Switzerland. Jun 01 - Jun 17: Institute for Advanced Topics in the Digital Humanities in Charlotte, NC. Jun 14 - Jun 15: FuturICT's Living Earth Platform and Interactive Observatories Meeting in Zürich, Switzerland. Jun 09: Research Seminar, Dirk Helbing Team in Zürich, Switzerland. Mar 07 - May 24: Places & Spaces Exhibit at University of Michigan in Ann Arbor, MI. Apr 12 - Apr 16: AAG Annual Meeting 2011 in Seattle, WA. Apr 11 - Apr 14: Second Annual International Science of Team Science Conference in Chicago, IL. Apr 05 - Apr 06: HUBbub 2011! in Indianapolis, IN. Mar 31: Guest Lecture in Cassidy Sugimoto's S604 Scholarly Communication in Bloomington, IN. Mar 04 - Mar 05: The Third International Workshop on Network Theory: "Web Science meets Network Science" in Evanston, IL. Mar 03: VIVO 18 months review in Bloomington, IN. Feb 17: Center for Bioinformatics and Computational Biology, National Institute of General Medical Sciences, NIH in Washington, DC. Feb 08 - Feb 13: INSNA Sunbelt Social Networks Conference: Sunbelt XXXI in St Pete Beach, FL, USA. Feb 08: Workshop on Scholarly Communication and Informetrics iConference 2011 in Seattle, WA. Jan 28: the School of Informatics and Computing Colloquium Series in Bloomington, IN. Dec 02 - Dec 03: Workshop on the Science of Science Measurement in Washington, DC. Dec 01: Mapping the Structure and Evolution of Sustainability Science in Washington DC, . Nov 16 - Nov 17: The Challenges of Visualising Biological Data in Swindon, Wiltshire, UK. Nov 15: CASA Seminar Series in London, England. Oct 27: Office of the Vice Provost for Research in Bloomington, IN. Oct 19: NSF SciSIP Grantees Workshop: Toward a Community of Practice in Washington DC, . Sep 27: University Information Technology Services Presentation, Indiana University in Bloomington, IN. Aug 15 - Aug 27: Networks and Network Analysis for Humanities: An NEH Institute for Advanced Topics in Digital Humanities in Los Angeles, CA. Aug 12 - Aug 13: First Annual VIVO National Conference in New York, NY. Jul 06 - Jul 28: NIH. Jul 05 - Jul 28: Visiting Professor at the Reporting Branch, Office of Extramural Research, NIH. (Robin Wagner, Chief, Reporting Branch, Division of Information Services) in Bethesda, MD. Jun 21 - Jun 25: Joint Conference on Digital Libraries 2010 in Surfers Paradise, Queensland, Australia. Jun 24: Basser Seminar Series, School of Information Technologies, University of Sydney in Sydney, Australia. Jun 07: National Science Foundation CISE and SBE AC Subcommittee: Discovery in a Research Portfolio: Tools for Structuring, Analyzing, Visualizing and Interacting with Proposal and Award Portfolios in Arlington, VA.
Mar 18 - May 31: Places and Spaces: Mapping Science at the Marston Science Library, University of Florida in Marston Science Library, UF, Gainesville, US. May 27 - May 29: Third European Conference on Scientific Publishing in Biomedicine and Medicine in Leiden, The Netherlands. May 06: The MIT Press: Fall 2010 Publications Preview in Cambridge, MA. Apr 30: Ph.D. Thesis Defense, Department of Informatics, Indiana University, Bloomington in Bloomington, IN. Apr 22 - Apr 24: First Annual International Science of Team Science Conference in Chicago, IL. Apr 22: Science-Based Business Initiative Seminars, Harvard Business School in Boston, MA. Apr 10 - Apr 16: Micah Linnemeier and Chintan Tank visit Jon Corson Rikert and the VIVO programming team at Cornell University for planning, coordination, and implementation strategies..
Mar 29 - Mar 31: 2010 International Conference on Social Computing, Behavioral Modeling and Prediction in Bethesda, MD. Mar 31: 2010 International Conference on Social Computing, Behavioral Modeling and Prediction in Bethesda, MD. Mar 22 - Mar 23: Alan Porter (Georgia Tech) and Ismael Rafols (University of Sussex) visit the Center..
Mar 18 - Mar 19: NIH Workshop on Identifiers and Disambiguation in Scholarly Work, Katy Börner and Mike Conlon, organizers. Mar 09 - Mar 10: Towards Evidence-based policy making for Science, technology and Innovation. Center for Research and Development Strategy (CRDS), Japan Science and Technology Agency, Tokyo, Japan (Asako Okamura) in Tokyo, Japan. Mar 02 - Mar 07: André Skupin visits the Center, collaborating on the refinement of self-organizing mapping algorithms. Mar 04 - Mar 05: NSF/JSMF Workshop on Mapping of Science and Semantic Web, Indiana University, Katy Borner, Ying Ding and Peter Fox, organizers. Mar 03: VIVO Intensive Session with Mike Conlon and Chris Barnes (Univ. Florida) and Jon Corson-Rikert (Cornell) and the IU VIVO Development Team at our Center. .
Feb 13 - Feb 28: George Kampis, Laszlo Gulyas and Zoltan Szászi visit the center to further the integration of CIShell and TexTrend. Feb 19 - Feb 20: International Seminar on Multidimensional Network Theory, Annenberg School for Communication, University of Southern California . Feb 04: Julie Thompson Klein, Wayne State University visits our Center..
Jan 22: Debriefing and summation of the NAS Federal Funds Report from Committee Members. Jan 18 - Jan 19: Charlotte Kirk-Baer and Robbin Shoemaker, Under Secretary's office for Research, Education, and Economics at the U.S. Department of Agriculture (USDA) in Washington, DC visit our Center. .
Dec 10: An Innovation Dashboard for Congress: ASTRA Seminar Series in Washington DC, . Dec 07: Networks and Complex Systems Talk Series, Fall 2009 in Bloomington, IN. Dec 03: Seminar, The Beckman Institute for Advanced Science and Technology, University of Illinois in Urbana, IL. Nov 20: School of Informatics Colloquium Series, IUPUI in Indianapolis, IN. Nov 20: NWB Colloquium Talk and Workshop in Indianapolis, IN. Nov 13: Guest Lecture, S701, School of Library and Information Science (Jacobs) in Bloomington, IN. Nov 11: Guest Lecture, I501 Informatics (Johan Bollen) in Bloomington, IN. Oct 25 - Oct 27: The International Symposium on Wikis and Open Collaboration in Orlando, FL. Oct 21: Workshop on STEM Enterprise: Measures for Innovation and Competitiveness in Washington, DC. Oct 20: Workshop on the use of Scientometric Tools: Network Workbench and Sci2 in NIH Bethesda, Maryland, US. Oct 06 - Oct 09: Modelling Science: Understanding, Forecasting, and Communicating the Science System in VKS KNAW, Amsterdam, The Netherlands. Oct 07: Modelling Science: Understanding, Forecasting and Communicating the Science System, History and Taxonomy Session in VKS KNAW, Amsterdam, The Netherlands. Sep 15: Deadline for the 2009 International Science & Engineering Visualization Challenge in Arlington, VA.
Sep 01 - Sep 03: Northwestern Institute on Complex Systems (NICO) Complexity Conference in Evanston, IL. Sep 03: Northwestern Institute on Complex Systems (NICO) Complexity Conference Workshops in Evanston, IL. May 01 - Aug 31: André Skupin spends three weeks in our center. Aug 10 - Aug 22: Information Kinetics: Egoviz in San Sebastian, Spain. Aug 12 - Aug 14: Structured Data, Synthetic Minds: Visualizing the Dynamics of KnowledgeMedia X Vanguard Visualization Collaboratory in Stanford, CA. Aug 12: Vanguard Reception, Visualization for Collective, Connective & Distributed Intelligence Dynamic Knowledge Networks: Synthetic Minds in Stanford, CA. Aug 12: Structured Data, Synthetic Minds: Visualizing the Dynamics of KnowledgeMedia X Vanguard Visualization Collaboratory in Stanford, CA. Aug 12: Structured Data, Synthetic Minds: Visualizing the Dynamics of Knowledge Media X Vanguard Visualization Collaboratory, 2nd Presentation in Stanford, CA. Feb 11 - Aug 04: Yunwei Chen works at our center. Jul 26 - Jul 31: Visualization in Science and Education, The Gordon Research Conference in Oxford, UK. Jul 26 - Jul 30: Visualization in Science and Education - Gordon Research Conference in Oxford, UK. Jul 20: Collaborative Meeting at BIREME, a Pan American Health Organization, and affiliate of the WHO, the Federal University of São Paulo and the Brazilian Ministries of Health and Education in São Paulo, Brazil. Jul 20: Fundação de Amparo à Pesquisa do Estado de São Paulo (Foundation for Research Support of the State of São Paulo-FAPESP) in São Paulo, Brazil. Jul 14 - Jul 17: 12th International Conference on Scientometrics and Informetrics in Rio de Janeiro, Brazil. Jul 14 - Jul 17: 12th International Conference on Scientometrics and Informetrics (ISSI 2009) in Rio de Janeiro, Brazil. Jul 15 - Jul 17: Symposium on Knowledge Domain Visualizations in Barcelona, Spain. Jun 01 - Jun 30: History of Science Workshop in Bloomington, IN. Jun 14 - Jun 16: NA-CAP@IU 2009: Networks and Their Philosophical Implications in Bloomington, IN. Jun 14 - Jun 16: IU Showcase Session and Mapping Science Exhibit at Computing and Philosophy (NACAP) Conference in Bloomington, IN. Jun 12 - Jun 14: Society for Philosophy and Psychology Annual Conference in Bloomington, IN. Jun 09 - Jun 10: ICSTI 2009 Conference: Managing Data for Science in Ottawa, Ontario, Canada. Jun 09 - Jun 10: International Council for Scientific and Technical Information Conference in Ottawa, Ontario, Canada. May 17 - May 20: Visualization and Monitoring of Network Traffic in Wadern, Germany. May 14: Meeting and Presentation at the National Institutes of Health, Bldg 1, Room 151 in Bethesda, MD. Apr 21 - Apr 25: Mapping Science Exhibit at NetSci 2009 in Venice, Italy. Apr 24: First IEEE International Workshop on Network Science For Communication Networks. Apr 08: Center for Data and Search Informatics Spring 2009 Seminar Series in Bloomington, IN. Apr 08: Data and Search Institute Seminar in Bloomington, IN. Mar 22 - Mar 27: Annual Meeting of the Working Group "Physics of Socio-Economic Systems" of the German Physical Society in Dresden, Germany. Mar 24 - Mar 25: NSF SciSIP Grantees Workshop: Toward a Community of Practice in Washington DC, . Mar 24 - Mar 25: AAAS-NSF Workshop for SciSIP Grantees in Washington, DC. Mar 10 - Mar 15: INSNA Sunbelt Social Networks Conference: Sunbelt XXIX in San Diego, CA. Feb 23 - Feb 24: Katy visits NYC Seed in New York, NY. Feb 23 - Feb 24: Topological Methods in Data Analysis and Visualization: Theory, Algorithms, and Applications in Snowbird, UT. Feb 23: Communicating the Structure and Evolution of Science and the associated work of the Cyberinfrastructure for Network Science Center to the SEED Media Group/SEED.com in New York, NY. Feb 13: Waterman Committee Meeting. Jan 29 - Jan 30: Workshop on the Future of Interactive Media in Santa Barbara, CA. Jan 26 - Jan 27: Peter Gloor visits our Center. Jan 22: The 12th SANKEN International Symposium in Osaka, Japan. Jan 21: Talk in SAP Media X 2009 Winter Quarter Seminar Series in Stanford, CA. Jan 19 - Jan 20: SPIE Conference on Visualization and Data Analysis in San Jose, CA. Jan 15 - Jan 16: NSF CreativeIT Program PI Meeting in Arlington, VA.
Jan 15 - Jan 16: Creative Metaphors to Stimulate New Approaches to Visualizing, Understanding, and Rethinking Large Repositories of Scholarly Data Talk at CreativeIT Workshop in Arlington, VA.
Jan 06 - Jan 09: IPlant Collaborative Cyberinfrastructure Workshop in Oracle, AZ. Jan 08 - Jan 09: NSF Workshop on Geo-Spatial and Geo-Temporal Informatics (GSTI) in Arlington, VA.
Dec 18 - Dec 19: QMSS-2 2008 Workshop Communication Networks on the Web in VKS KNAW, Amsterdam, The Netherlands. Dec 11 - Dec 12: 3rd Annual iFQ Conference: Foresight-Between Science and Fiction in Bonn, Germany. Dec 11 - Dec 12: Talk and Exhibit at the Foresight Tagung in Bonn, Germany. Dec 03 - Dec 04: SoSP Conference in Washington, DC. Sep 17 - Dec 03: Digital Library Brown Bag: Fall 2008 in Bloomington, IN. Nov 24 - Nov 25: Science in Society: Dialogues and Scientific Responsibility in Paris, France. Nov 19: NWB Workshop in Ann Arbor, MI. Nov 18: Network Workbench Workshop in Ann Arbor, MI. Nov 12 - Nov 14: Talk & NWB Workshop on Life Sciences and Specialized Services in Ithaca, NY. Nov 13: Workshop on Network Workbench in Ithaca, NY. Nov 11: Russell Duhon visits Noshir Contractor's Group in Evanston, IL. Nov 06: S701: Introduction to Doctoral Research in Information Science in Bloomington, IN. Nov 05: I501: Introduction to Informatics in Bloomington, IN. Nov 05: Indiana University Digital Library Brown Bag Luncheon Series in Bloomington, IN. Oct 26 - Oct 30: ACM Seventeenth Conference on Information and Knowledge Management (CIKM 2008) in Napa Valley, CA. Oct 30: Enrique Campos-López visits our Center. Oct 28 - Oct 29: Intelligence Advanced Research Projects Activity (IARPA) Conference on Information Extraction from Technical Literature in Chicago, IL. Oct 22 - Oct 23: Final Meeting of the Modernizing the Infrastructure of the National Science Foundation Federal Funds Survey NRC Panel. Oct 01 - Oct 22: Andr Skupin Visits the Lab. Oct 19: IEEE Information Visualization Conference (InfoVis 2008) in Columbus, OH. Oct 02 - Oct 03: Science of Science Management Meeting in Bethesda, MD. Oct 01 - Oct 02: The Grand Challenge Workshop: Mechanistic Basis of Plant Adaptation in Oracle, AZ. Sep 01 - Sep 30: Visualization Summit in Zürich, Switzerland. Sep 01 - Sep 30: Expedition Workshop on Science of Science and Innovation Policy in Arlington, VA.
Sep 26: UIUC/IU/UM Meeting in Merrillville, IN. Sep 23 - Sep 24: SNAP: Systematic Network Analysis of Pathophysiology in Bethesda, MD. Sep 15 - Sep 21: Visual Week 2008 in Ammersee, Germany. Sep 19 - Sep 21: Fifth International Conference on the Theory and Application of Diagrams (Diagrams 2008) in Brighton, UK. Sep 16 - Sep 20: 10th International Conference on Science and Technology Indicators in Vienna, Austria. Sep 16 - Sep 19: 8th Regional Congress on Health Sciences Information (CRICS8) in Rio de Janeiro, Brazil. Sep 16 - Sep 17: ACM SoftVis in Ammersee, Germany. Sep 11 - Sep 13: The Oxford eResearch Conference 2008 in Oxford, UK. Sep 08 - Sep 12: Invited Talk at Science in the 21st Century in Waterloo, Ontario, Canada. Sep 11 - Sep 12: NSF Workshop on A Deeper Look at the Visualization of Scientific Discovery in the Federal Context in Arlington, VA.
Sep 10: Make IT Happen in Bloomington, IN. Sep 05 - Sep 06: Workshop on Modernizing the Infrastructure of the National Science Foundation Federal Funds Survey in Washington, DC. Aug 31 - Sep 05: Summer School on the Analysis of Political and Managerial Networks (POLNET) in Konstanz, Germany. Sep 03 - Sep 04: Conference on Patent Statistics for Decision Makers "Patenting, Innovation, Valuation" in Vienna, Austria. Sep 03 - Sep 04: NRC Mapping Science Committee Meeting in Washington, DC. Aug 11 - Aug 13: SIGGRAPH 2008: The 35th International Conference and Exhibition on Computer Graphics and Interactive Techniques in Los Angeles, CA. Jul 29 - Aug 01: 4th International Conference on Webometrics, Informetrics and Scientometrics & 9th COLLNET Meeting in Berlin, Germany. Jul 10 - Jul 12: The 2008 North American Conference on Computing and Philosophy in Bloomington, IN. Jul 08 - Jul 11: 12th International Conference on Information Visualisation in London, UK. Jul 07: Meetings at the National Research Council in Ottawa, Ontario, Canada. Jun 28 - Jul 06: Summer School on Social Cognition (Minds and Societies) in Montreal, QC, Canada. Jul 01 - Jul 02: Talk at Industrial Conference on Data Mining (ICDM) in Leipzig, Germany. May 17 - Jun 30: Places and Spaces: Mapping Science in Beijing, China. May 01 - Jun 30: Ingo Gunther visits Center in Bloomington, IN. Jun 23 - Jun 27: NetSci 2008 in Norwich, UK. Apr 03 - Jun 27: Places & Spaces Exhibit at NRC in Ottawa, Ontario, Canada. Jun 12 - Jun 13: Panel on Modernizing the Infrastructure of the National Science Foundation Federal Funds Survey in Washington, DC. May 29 - May 30: Human Computer Interaction Lab's 25th Annual Symposium in Washington, DC. May 20 - May 30: McGill Summer Sessions in Systems Biology Dynamics in Montreal, Quebec, Canada. May 26 - May 28: Eurographics/IEEE Computer Society VGTC Symposium on Visualization in Eindhoven, The Netherlands. May 12 - May 16: 28th CNLS Annual Conference: Challenges in Information Science and Technology in Santa Fe, NM. May 06: NCRR Staff Meeting in Bethesda, MD. May 06: NCRR & BISTI Talk in Bethesda, MD. May 06: Waterman Committee Dinner in Washington, DC. Jan 07 - May 02: SLIS Friday Conversation Series in Bloomington, IN. Jan 07 - May 02: 2008 Spring Digital Arts and Humanities Brown Bag in Bloomington, IN. Apr 25 - Apr 29: Howard White Visits SLIS. Apr 14 - Apr 16: Mike Smoot Vists CNS Center. Apr 07 - Apr 08: NSF Workshop on Knowledge Management and Visualization Tools in Support of Discovery (II) in New York, NY. Mar 31: Expert Panel Workshop on Cyberinfrastructure in Behavioral Medicine in San Diego, CA. Mar 27 - Mar 29: US-China Workshop on Designing Cyberinfrastructure to Enable US-China Collaboration in Tobacco Research in Beijing, China. Mar 18: Talk at Legal Education Lunch, IU School of Law in Bloomington, IN. Mar 12: Talk at NCI in Bethesda, MD. Mar 11 - Mar 12: NSF Workshop on Knowledge Management and Visualization Tools in Support of Discovery (I) in Arlington, VA.
Mar 05 - Mar 07: IEEE Pacific Visualization Symposium in Kyoto, Japan. Mar 07: Johan bollen Visits CNS Center. Mar 01 - Mar 03: China Workshop: Designing Cyberinfrastructure to Enable US-China Collaboration in Tobacco Research in Beijing, China. Feb 29: Talk at NSF National Evolutionary Synthesis Center in Durham, NC. Feb 28: Meeting with Ben Van Houten. Feb 18 - Feb 21: Semantic Technologies in Astronomy Workshop in Pasadena, CA. Feb 08: Waterman Committee Meeting in Washington, DC. Jan 28 - Jan 31: SPIE Conference on Visualization and Data Analysis in San Jose, CA. Jan 22 - Jan 28: Sunbelt XXVIII: International Sunbelt Social Network Conference in St. Pete Beach, FL. Jan 25: Talk at Virtual Knowledge Studio (VKS) in VKS KNAW, Amsterdam, The Netherlands. Jan 24: Meetings at Rathenau Institute in Den Haag, The Netherlands. Jan 20 - Jan 24: Evolution and Physics Concepts, Models and Applications, Interdisciplinary Seminar of the Heraeus Foundation in Bad Honnef, Germany. Jan 18: Meeting with Scopus in VKS KNAW, Amsterdam, The Netherlands. Jan 03: Meeting at OSTI in Oak Ridge, TN. Jan 03: American Museum of Science and Energy Places & Spaces Exhibition in Oak Ridge, TN. Dec 15 - Dec 20: Geovisualization in Hong Kong, Hong Kong Special Administrative Region, China. Dec 13 - Dec 14: Ben Shneiderman Visits the Lab. Dec 10: Talk Series on Network and Complex Systems in Bloomington, IN. Dec 07: T600 Seminar in Department of Telecommunications in Bloomington, IN. Dec 07: Mapping Scholarly Communication Patterns Talk in Bloomington, IN. Nov 14: GIS Day in Bloomington, IN. Oct 28 - Nov 02: International Conference on Complex Systems in Boston, MA. Oct 28 - Oct 30: IEEE Visualization 2007 Conference in Sacramento, CA. Oct 28 - Oct 30: IEEE VAST 2007 Symposium in Sacramento, CA. Oct 27 - Oct 28: Image and Meaning (IM2.4) Workshop in Cambridge, MA. Oct 27: Bring IT On! Workshop: Women in Computing Group in Bloomington, IN. Oct 26: Workshop on Science (Weather) Forecasts in New York, NY. Oct 21 - Oct 23: 2007 Microsoft eScience Workshop at RENCI in Chapel Hill, NC. Oct 15: Cyberinfrastructure for Network Science and InfoViz Lab Annual Open House in Bloomington, IN. Oct 11 - Oct 13: 2007 Society for Social Studies of Science (4S) Annual Meeting in Montreal, Quebec, Canada. Oct 11 - Oct 12: Third Annual Conference on Topic Maps Research and Applications in Bloomington, IN. Oct 09 - Oct 10: Third International Conference on e-Social Science in Ann Arbor, MI. Oct 01 - Oct 10: Bruce visited Mike Smoot in San Diego, CA. Oct 08 - Oct 09: Invited Panelist at "Flagship Projects in e-Social Science," Third International Conference on e-Social Science in Ann Arbor, MI. Oct 09: Bruce met with Gully Burns and Dave Newman in Irvine, CA. Oct 01 - Oct 06: European Conference on Complex Systems (ECCS'07) in Dresden, Germany. Oct 06: 2007 SLIS PhD Research Forum in Bloomington, IN. Oct 04 - Oct 05: Information: Design, Experience, Access (IDEA) 2007 in New York, NY. Sep 27 - Sep 28: NSF Workshop on Visual Exploration in Washington, DC. Sep 10: 2007 Cyberinfrastructure for Network Science Center Weekly Research Presentation in Bloomington, IN. Aug 14: Office of Intergovernmental Solutions, NSF Collaborative Expedition #64 in Washington, DC. Aug 05 - Aug 09: SIGGRAPH 2007: The 34nd International Conference and Exhibition on Computer Graphics and Interactive Techniques in San Diego, CA. Aug 06: Trey Ideker's Group Talk at UCSD in San Diego, CA. Jul 20: The Research Center for Grid and Service Computing (VEGA Center) at the Institute of Computing Technology (ICT) of the Chinese Academy of Sciences (CAS) in Beijing, China. Jul 18: Complex Systems Summer School in Beijing, China. Jul 15 - Jul 17: Microsoft Research Faculty Summit in Redmond, WA. Jul 04 - Jul 06: 11th International Conference on Information Visualization in Zürich, Switzerland. Jul 03: Visualization Summit in Zürich, Switzerland. Jul 02: 5th International Conference on Coordinated & Multiple Views in Exploratory Visualization in Zürich, Switzerland. Jun 28 - Jun 30: New Network Theory International Conference in VKS KNAW, Amsterdam, The Netherlands. Jun 25 - Jun 27: 11th International Conference of the International Society for Scientometrics and Informetrics in Madrid, Spain. Jun 17 - Jun 23: ACM IEEE Joint Conference on Digital Libraries in Vancouver, BC, Canada. Jun 13 - Jun 15: Creativity and Cognition Conference in Washington, DC. Jun 08: Meeting with Dr. Annette Schavan, Bundesministerin fr Bildung und Forschung and Prof. Dr. Matthias Kleiner, Prsident der Deutschen Forschungsgemenschaft (DFG) in Washington, DC. May 31 - Jun 01: 24th Annual Human-Computer Interaction Lab Symposium & Workshop in College Park, MD. May 28 - Jun 01: InfoVis Seminar in Wadern, Germany. May 01 - May 30: Mapping Science Exhibit in Bloomington, IN. May 01 - May 30: Mapping Science Exhibit in São Paulo, Brazil. May 20 - May 25: International Workshop and Conference on Network Science 2007 in New York, NY. May 20: Visualizing Network Dynamics Competition in New York, NY. May 14 - May 17: Understanding Complex Systems 2007 in Urbana, IL. May 17: Presentation of Mapping Science Exhibit to University Research Magazine Association in Bloomington, IN. May 15: Lunch Presentation of Mapping Science Efforts in Washington, DC. May 14: Alan T. Waterman Award Ceremony in Washington, DC. May 14: Mapping the Evolving Interface of Mainstream Chemistry and the Fields of Biochemistry, Biology, and Bioengineering in Washington, DC. May 14: Mapping Chemistry and the Places & Spaces Exhibit, Complexity and Emergent Phenomena in Chemical Systems Workshop in Washington, DC. May 11: Places and Spaces Talk Series in Bloomington, IN. May 10: Places and Spaces Talk Series in Bloomington, IN. Feb 05 - May 07: Spring 2007 Talk Series on Networks and Complex Systems in Bloomington, IN. May 01 - May 06: Sunbelt XXVII:International Sunbelt Social Network Conference in Corfu, Greece. May 05: Ketan Mane visits for Graduation in Bloomington, IN. May 04: Places and Spaces Talk Series in Bloomington, IN. Apr 17 - Apr 21: Association of American Geographers (AAG) Annual Meeting 2007 in San Francisco, CA. Apr 19 - Apr 20: Good Experience Live (GEL) 2007 in New York, NY. Mar 28 - Mar 31: International Symposium on Self-Organizing Online Communities in Ithaca, NY, USA. Mar 25 - Mar 29: Places & Spaces on Display at the 233rd - ACS National Meeting & Exposition in Chicago, IL. Mar 26: NSF Town Hall Meeting at ACS in Chicago, IL. Mar 05 - Mar 08: EclipseCon 2007 in Santa Clara, CA. Feb 23: Meeting of the Alan T. Waterman Award Committee in Washington, DC. Feb 04 - Feb 13: Gavin LaRowe and Katy Brner work at the National Institute of Informatics in Tokyo, Japan. Feb 13: Talk at National Institute of Science and Technology Policy (NISTEP) in Tokyo, Japan. Feb 03 - Feb 12: Visit to the National Insititute of Informatics in Tokyo, Japan. Feb 01 - Feb 02: IM 2.3 Winter Workshop at Apple in Cupertino, CA. Jan 28 - Feb 01: SPIE Conference on Visualization and Data Analysis in San Jose, CA. Jan 31: Talk in Mountain View, CA. Jan 29 - Jan 30: Designing Cyberinfrastructure for Collaboration and Innovation in Washington, DC. Dec 09 - Feb 25: Places & Spaces on Display at the New York Hall of Science in New York, NY. Dec 13: Talk at OCI, NSF in Washington, DC. Dec 11 - Dec 12: NIH Conference on Knowledge Environments for Biomedical Research in Bethesda, MD. Nov 10 - Nov 17: Riccardo Brancaleon visits our lab in Bloomington, IN. Oct 30 - Oct 31: The Science of Team Science Conference in Bethesda, MD. Oct 25: Workshop on Science (Weather) Forecasts in New York, NY. Oct 23 - Oct 25: Workshop on New Horizons in Internet Site Development in Cold Spring Harbor, NY. Oct 16: CI4NetSci Center & IV Lab Open House in Bloomington, IN. Sep 21: Cambridge Colloquium on Complexity and Social Networks in Boston, MA. Sep 18: CS Honors Seminar in Bloomington, IN. Sep 16: SLIS Doctoral Student Research Forum 2006 in Bloomington, IN. Sep 07 - Sep 08: IM2.2 Workshop in Chicago, IL. Sep 07: Image and Meaning 2.x Workshop in Chicago, IL. Sep 07: Image and Meaning 2.1 Workshop in Chicago, IL. Aug 21 - Aug 22: NIH Roadmap: Interdisciplinary Methodology and Technology Summit in Bethesda, MD. Aug 18: CS Honors Seminar in Bloomington, IN. Aug 17 - Aug 18: Workshop on Scholarly Data and Data Integration in Bloomington, IN. Aug 15: Telcordia Technologies Applied Research Midnight Seminars in New York, NY. Jul 20: How Information Visualization Can Support NCI's Fight Against Cancer in Bethesda, MD. Jul 20: Informatics in Action Talk Series in Washington, DC. Jul 12: Science of Science Policy Workshop in Helsinki, Finland. Jul 10: OXII in Oxford, UK. Jul 07 - Jul 09: James S. McDonnel Foundation 21st Century Science Initiative: 2006 Program Meeting in Palisades, NY. Jul 06 - Jul 08: Symposium on Knowledge Domain Visualizations in London, UK. Jul 06: Centre for Advanced Spatial Analysis in London, UK. Jun 25 - Jun 30: International Conference on Complex Systems (ICCS2006) in Boston, MA. Jun 15 - Jun 18: The New Cognitive Sciences, Workshop at the Konrad Lorenz Institute for Evolution and Cognition in Altenberg, Austria. Jun 12 - Jun 15: 2006 TeraGrid Conference in Indianapolis, IN. Jun 02 - Jun 07: ALIFE X: Tenth International Conference on the Simulation and Synthesis of Living Systems in Bloomington, IN. Jun 07: Program Meeting of the James S. McDonnell Foundation, 21st Century Science Initiative 2006 in Palisades, NY. Jun 02: IM2.x Workshop Series to Improve Visual Communication of Science in Research Triangle Park, NC. May 16 - May 22: International Workshop and Conference on Network Science 2006 in Bloomington, IN. May 21: Modeling Science Workshop in Bloomington, IN. May 18 - May 20: The Atlanta Conference on S&T Policy 2006: US-EU Policies for Research and Innovation in Atlanta, GA.
May 15 - May 18: 6th Understanding Complex Systems Symposium: Molecular Origin of Life and Dynamics of Information, Energy and Water Flows on Evolving Networks in Urbana, IL. Feb 13 - May 12: Symposium at NCSA: The Age of Networks: Social, Cultural and Technological Connections in Champaign, IL. May 10 - May 12: The International Workshop on Webometrics, Informetrics and Scientometrics & Seventh COLLNET Meeting in Nancy, France. Apr 14 - May 07: Riccardo Brancaleon visits our lab in Bloomington, IN. May 04: GEL 2006 in New York, NY. May 01 - May 02: Symposium on the Future of Visualization in Chicago, IL. Apr 24 - Apr 30: Sunbelt XXVI: International Sunbelt Social Network Conference in Vancouver, BC, Canada. Apr 11: I-ASIST Meeting in Austin, TX. Apr 03: Places & Spaces Opening Reception at New York Public Library in New York, NY. Mar 28: Guest Lecture in Ron Day's L524 in Bloomington, IN. Mar 26: Networks and Agent Networks (NaN) Weekly Meeting in Bloomington, IN. Mar 22: Information Visualization Lab Talk in Bloomington, IN. Mar 10: The Age of Networks: Social, Cultural and Technological Connections: Center for Advanced Study in Urbana, IL. Mar 01: Life Sciences Exhibit & Reception in Indianapolis, IN. Feb 27: The Future of Science and Technology: Workshop sponsored by UK Government and organized by Institute for the Future, Rockefeller Foundation in New York, NY. Feb 06: Symposium on Knowledge Discovery and Knowledge Management Tools in Washington, DC. Jan 22 - Jan 24: TV Intensive Session with Brad Paley in Bloomington, IN. Jan 22 - Jan 24: Globe Mapping Intensive Session with Ingo Gnther in Bloomington, IN. Jan 15 - Jan 19: Conference on Visualization and Data Analysis 2006 (EI10); IS&T/SPIE's International Symposium on Electronic Imaging 2006 in San Jose, CA. Jan 16 - Jan 19: ALISE Annual Conference 2006 in San Antonio, TX. Dec 15 - Dec 17: TV Intensive Session with Brad Paley in Bloomington, IN. Dec 13: IVCSF Plugin Integration Intensive Session in Bloomington, IN. Dec 08: Google Maps for 1st and 2nd Graders in Bloomington, IN. Dec 01 - Dec 02: Places & Spaces; Mapping Science Meeting in Philadelphia, PA.
Nov 17 - Nov 22: National Institute of Informatics in Tokyo, Japan. Nov 12 - Nov 18: SC/05: Gateway to Discovery in Seattle, WA. Nov 11 - Nov 12: JETT 2005: Workshop in Bloomington, IN. Nov 10: Google Maps for 1st and 2nd Graders in Bloomington, IN. Nov 03 - Nov 05: Social Networks and Cyberinfrastructure (SNAC): The Role of Social Network Research in Enabling Cyberinfrastructure in Urbana, IL. Oct 28 - Nov 02: 2005 Annual Meeting of the American Society for Information Science and Technology in Chicago, IL. Oct 23 - Oct 25: IEEE Symposium on Information Visualization in Minneapolis, MN. Oct 20 - Oct 23: CERN Workshop on Innovations in Scholarly Communications (OAI4) in Geneva, Switzerland. Oct 20 - Oct 22: 2005 Annual Meeting of the Society for Social Studies of Sciences in Pasadena, CA. Oct 05 - Oct 09: Internet Research 6.0: Internet Generations in Chicago, IL. Oct 06 - Oct 07: NY Hall of Science Meetings in New York, NY. Oct 03: InfoVis Lab Open House in Bloomington, IN. Sep 24: SLIS Doctoral Student Research Forum 2005 in Bloomington, IN. Sep 21 - Sep 22: I-Light 2005 Symposium, IUPUI in Indianapolis, IN. Sep 15 - Sep 17: Network Workbench Kick-Off Meeting at IUB in Bloomington, IN. Sep 01 - Sep 03: WISP 2005 in Faro, Portugal. Jul 31 - Aug 04: SIGGRAPH 2005: The 32nd International Conference on Computer Graphics and Interactive Techniques in Los Angeles, CA. Jul 24 - Jul 28: 10th International Conference of the International Society for Scientometrics and Informetrics (ISSI 2005) in Stockholm, Sweden. Jul 12: IUs Technology Transfer Office in Indianapolis, IN. Jul 06 - Jul 08: The 9th International Conference on Information Visualisation in London, UK. Jul 06 - Jul 08: Symposium on Knowledge Domain Visualizations at IV 2005: Ninth International Conference on Information Visualization in London, UK. Jul 07: Talk at Center for Advanced Spatial Analysis, University College in London, UK. Jul 04: Talk at the School of Computing and Information Technology, University of Wolverhampton in Wolverhampton, UK. Jun 23 - Jun 25: Image and Meaning 2: A Collaborative Exploration to Discover New Visual Expressions in Science and Technology in Los Angeles, CA. May 16 - Jun 04: Summer Institute on Agent Based Modeling and Natural Resource Governance in Bloomington, IN. May 15 - May 27: School and Workshop on Structure and Function of Complex Networks in Trieste, Italy, Italy. May 15 - May 27: Lecturer at the Abdus Salam International Centre for Theoretical Physics (ICTP) in Trieste, Italy, Italy. May 25 - May 26: Fifth Annual AISTI Conference, 2005: Seeds of Transformation for Digital Libraries in Santa Fe, NM. May 18 - May 21: Fifth Triple Helix Conference: The Capitalization of Knowledge: Cognitive, Economic, Social and Cultural Aspects in Turin, Italy. May 16 - May 19: Understanding Complex Systems 2005 in Champaign, IL. May 01 - May 04: MeshForum; Connecting Networks in Chicago, IL. Jan 10 - May 02: Spring 2005 Talk Series on Networks and Complex Systems in Bloomington, IN. Apr 26: Meeting on the National Science Board (NSB) "Transformational Research" Study in Washington, DC. Apr 20: 2005 SLIS PhD Research Forum in Bloomington, IN. Apr 05 - Apr 09: 101st Annual Meeting of the Association of American Geographers in Denver, CO.
Mar 30: WIC Technical Tour in Bloomington, IN. Feb 16 - Feb 20: Sunbelt XXV: International Sunbelt Social Network Conference: International Network for Social Network Analysis in Redondo Beach, CA. Feb 16: Make IT Happen in Bloomington, IN. Jan 19: EnVision 2005: Exploring a New Visualization Infrastructure in Mountain View, CA. Jan 17 - Jan 18: Conference on Visualization and Data Analysis 2005, part of IS&T /SPIE's 17th Annual Symposium on Electronic Imaging 2005 in San Jose, CA. May 09 - Apr 11: Biocomplexity 7: Unraveling the Function and Kinetics of Biochemical Networks in Bloomington, IN. Dec 16: 2004 SLIS PhD Research Forum in Bloomington, IN. Nov 19: SLIS Colloquium in Bloomington, IN. Nov 15 - Nov 17: NSDL Annual Meeting in Chicago, IL. Nov 12: Colloquium at Department of History and Philosophy of Science in Bloomington, IN. Nov 05 - Nov 06: JETT 2004: Java Engagement for Teacher Training in Bloomington, IN. Oct 25: Supercomputing 2004 in Pittsburgh, PA.
Oct 22: ACM Board Meeting in New York, NY. Oct 20 - Oct 21: Panel Meeting on SRS's Evaluation of its Science and Engineering Taxonomies, NSF sponsored Workshop in Arlington, VA.
Oct 20: NSF IIS/CISE Talk in Arlington, VA.
Oct 10 - Oct 15: IEEE Information Visualization Conference in Austin, TX. Oct 09: Workshop on Information Visualization Software Infrastructures in Austin, TX. Oct 08: SLIS Colloquium in Bloomington, IN. Sep 29 - Oct 02: Symposium on Graph Drawing in New York, NY. Sep 23 - Sep 25: 8th Science and Technology Indicators Conference 2004 in Leiden, The Netherlands. Sep 18: SLIS Doctoral Student Research Forum 2004 in Bloomington, IN. Sep 10: IV-Lab Open House 2004 in Bloomington, IN. Aug 06 - Aug 07: First Symposium on Applied Perception in Graphics and Visualization/ACM SIGGRAPH in Los Angeles, CA. Jul 19 - Jul 21: First International Conference on Design Computing and Cognition in Cambridge, MA. Jul 14 - Jul 16: Symposium on Knowledge Domain Visualizations; IV 2004 in London, UK. Jul 12: INRIA in Paris, France. Jun 27 - Jul 02: Third Annual Summer Interdisciplinary Conference in Cavalese, Italy. Jun 26: Parmenides Center for the Study of Thinking in Elba, Italy. Jun 14 - Jun 16: Office of Science and Technology Policy (Executive Office of the President) in Washington, DC. May 27: First Annual Bioinformatics Conference in Indianapolis, IN. May 19 - May 21: Symposium on Visualization: Joint Eurographics - IEEE TCVG in Konstanz, Germany. May 17 - May 20: Understanding Complex Systems 2004 in Urbana, IL. May 12 - May 16: XXIV International Sunbelt Social Network Conference in Portoroz, Slovenia. Apr 28: CS Colloquium in Bloomington, IN. Apr 19 - Apr 21: Rob's Award Ceremony in Washington, DC. Mar 08: I-Light Symposium, IUPUI in Indianapolis, IN. Mar 03: Women in Science Research Day in Bloomington, IN. Feb 23: Guest Lecture in Noriko Hara's L643 Evaluation of Information Systems in Bloomington, IN. Feb 20 - Feb 21: Central Indiana Celebration of Women in Computing in Spencer, IN. Feb 04: Cognitive Lunch in Bloomington, IN. Jan 28: Center of Excellence on Knowledge Management and Discovery Meeting at SUN Microsystems in San Francisco, CA. Jan 18 - Jan 22: Conference on Visualization and Data Analysis 2004 (EI10): Part of IS&T/SPIE's International Symposium on Electronic Imaging 2004 in San Jose, CA. Jan 21: Meeting with Terry Winograd and Pat Hanrahan, Stanford University in Stanford, CA. May 21: SBC Fellows Summer Leadership Forum in Bloomington, IN. Apr 26: Interdisciplinary Experimental Lab Opening in Bloomington, IN. Mar 08: C.S. Honors Seminar in Bloomington, IN. Jul 19 - Jul 23: Animal Behavior Society, Conference 2003 in Boise, ID. Jul 16 - Jul 18: Seventh International Conference on Information Visualization - IV 2003 in London, UK. May 31: IVIRA: Information Visualization for Retrieval and Analysis in Houston, TX. May 09 - May 11: Arthur M. Sackler Colloquium on Mapping Knowledge Domains in Irvine, CA. Jan 01: Information Visualization Lab Meeting 2003 in Bloomington, IN. Dec 01 - Dec 31: I-Light Presentation in Indianapolis, IN. Dec 15: Information Visualization Laboratory Meeting in Bloomington, IN. Aug 05: Colloquium on Language and the New Media in Cardiff, Wales, UK. May 01 - May 31: Summer Intensive Session, 2002, School of Library and Information Science, Indiana University, Bloomington in Bloomington, IN. Oct 22 - Oct 23: IEEE Symposium on Information Visualization 2001 in San Diego, CA. Jul 25 - Jul 27: Information Visualization Conference (IV2001) in London, UK. Nov 30: Interdisciplinary Experimental Lab in Bloomington, IN. Nov 04 - Nov 10: SC2000: High Performance Networking and Computing Conference in Dallas, Texas. Sep 27: Guest Lecture in Javed Mostafa's 701 in Bloomington, IN. Jul 19 - Jul 21: Information Visualization, 2000: Symposium on Digital Libraries in London, UK. Jun 02 - Jun 07: ACM Digital Libraries 2000 in San Antonio, TX. Nov 30 - Dec 03: Design Computing on the Net'99 (DCNet'99) in Sydney, Australia.